The arc of long-running sitcoms bends toward ridiculousness. Let’s say it’s 1971, and you’re writer-producer Garry Marshall. After a few successful years working with your partner Jerry Belson on The Odd Couple, you’re ready to strike out on your own, so you make a pilot deal with ABC for a show set set in middle-class Milwaukee in the late 1950s. The pilot doesn’t sell, and gets burned off in a February 1972 episode of Love, American Style as the segment “Love And The Television Set.” But then in 1973, your star Ron Howard appears in the similarly nostalgic hit movie American Graffiti. So you revive the 1950s project, and this time ABC fast-tracks it, getting your newly titled Happy Days onto the air in January of 1974. The 16-episode first season reflects your vision for a sitcom about the recent past that gently debunks the myth of “a more innocent time,” via episodes that deal with teen sexuality, racial and class prejudice, and atomic-era hysteria. According to comedian Jon Hein, Happy Days went too far in the September 20, 1977 episode “Hollywood: Part 3”—known in pop culture lore as “that time when Fonzie jumped the shark.” During his college years, Hein and his friends started using “jumping the shark” as a shorthand for the pivot-point where a TV show’s audience-pandering impulses push it permanently off-course; and in 1997, he launched a Jump The Shark website that became a phenomenon, popularizing the concept that all cultural institutions have a freshness date, after which they’re permanently spoiled. It’s hard to argue against the idea that Happy Days declined in quality the longer it ran—or that any sitcom that’s around for 11 years won’t go into an irreversible skid at some point. But was “Hollywood: Part 3” really the beginning of the end? I can see why Hein would have that impression. Happy Days filled over 6,000 minutes of airtime between 1974 and 1984—not counting summer repeats and syndication—and even at its creative peak, only a hundred or so of those minutes were memorable. For people who watched the series in its original run, what stood out were certain jokes (many of which were repeated for years if they landed well the first time), the occasional plot line, and certain indelible images. One of the latter just happened to be a leather-jacketed greaser on waterskis, which might register to many as a hilarious mistake. In the actual context of the “Hollywood” three-parter, though? It kind of makes sense. If nothing else, these episodes catch Happy Days at its fullest strength. The earlier seasons are better, by 2015 standards. They’re shot with one camera, and sometimes achieve the same kind of low-key naturalism as the “New Hollywood” movies of the era. But Marshall and his team were still finding the perfect balance of characters and the right kinds of stories to tell at the start—and they weren’t really reaching a mass audience yet, at least relative to the times. So after finishing the second season outside Nielsen’s Top 30, the producers switched from single-cam-with-laugh-track to three-cam-with-studio-audience, and they focused more on the series’ breakout character, the super-cool local lothario and ex-hoodlum Arthur “Fonzie” Fonzarelli (played by Henry Winkler). The result? Season three finished at #11; season four ended at #1. The “Hollywood” trilogy kicked off the fifth season, and the third part finished at #3 in the ratings for the week, with a 50 share and 30 million viewers. In just a few years, the cast would either start to peel off or would stick around and show noticeable signs of boredom, and Happy Days would suffer accordingly. But “Hollywood” still features the whole gang: Fonzie, his straight-laced best friend Richie Cunningham (played by Howard), nerdy would-be crooner Warren “Potsie” Weber (Anson Williams), loudmouthed joker Ralph Malph (Don Most), the kindly Cunningham parents Howard and Marion (Tom Bosley and Marion Ross), their precocious daughter Joanie (Erin Moran), and local diner-owner Al Delvecchio (Al Molinaro). Each had their shtick, but they weren’t coasting on it yet. Meanwhile, the writers had figured out how to play both to their live audience and to the one watching at home. There was a good reason why Happy Days was so popular then: It was a superior model of the kind of bright, breezy sitcom that was becoming increasingly prevalent in 1976-77. Which isn’t to say there wasn’t reason for concern. The first part of “Hollywood” introduces a new character, Fonzie’s cousin Chachi Arcola, who in his very first scene is already establishing both his comic persona (as the industrious hustler, putting the moves on Joanie) and his own goofy catch phrase (“Wa wa wa!”). Also, the audience had started to whoop whenever their favorites walked into a scene, and to applaud after any half-decent joke, effectively slowing the pace. The writers are more committed to what this story allows—namely a lot of good-looking actors in bathing suits, and Henry Winkler showing off his ski skills—than to the story itself, as evidenced by how quickly they dispatch the recap at the start of parts two and three. In the first, Ron Howard catches the audience up in 20 seconds of voice-over. In the second, Al Molinaro reads a postcard with the pertinent details, including the negligible subplot about Richie’s summer fling with an oceanography student. What matters more though are all the little bits of business that fill in the spaces between the narrative. “Hollywood” has Howard and Marion lovingly nagging each other, Ralph reacting to everything with his broad grin and big laugh, and Potsie crooning “Will You Love Me Tomorrow?” at a beach party. It has Richie aw-shucks-ing his way around L.A., and the Fonz drawing hordes of pretty young ladies to his side with a snap of his fingers. And all three of these episodes devote most of their scenes to the relationship between Richie and Fonzie, and how Cunningham gets a different perspective on what’s really important in life from the down-to-earth Fonzarelli, but is also astute enough to recognize and manage The Fonz’s insecurities. That Ron Howard/Henry Winkler dynamic was a big reason why Happy Days turned a corner in the ratings in its third season. As Richie moved beyond mere hero worship, Fonzie too became more than just colorful comic relief. There’s a real touch of genius to the way Winkler played The Fonz: seemingly unflappable, but also often defensive, irritated, or nervous. It’s a nuanced performance, capturing both the cartoonishly capable and confident side of the character, along with the working-class kid who worries that other people are trying to make a fool of him. Two scenes in “Hollywood: Part 2” show Winkler’s range. In one, Richie tells Fonzie that the studio isn’t going to give him a contract, and Winkler goes from angry to stunned to muted to despondent in about a minute of screen time. In the other, The California Kid goads The Fonz into making a water-ski jump over a pen containing a man-eating shark. Ralph and Potsie pretty much accept the challenge on Fonzie’s behalf, while Winkler plays his Fonzarelli as both cocky daredevil and frightened little kid. Which brings us to that damn fish. When I said the shark-jumping makes sense, I meant it. Everything in the Fonzie/California Kid subplot serves a purpose, both thematically and as a business decision by the Happy Days producers. By the start of season five, it had been established that the show’s younger viewers liked episodes where some jerk tried to get the better of Fonzie and suffered the consequences. With “Hollywood” serving as the show’s big season premiere, why not do one of those stories? And since it’s set at the beach, why not have the ever-determined Fonz take up water-skiing? And when the two competitors tie in their big slalom race, why not come up with a tie-breaker that incorporates the jumping stunts that Fonzie’s done on the show before? Sure, the hero’s leather jacket and swimsuit ensemble looks silly; and yes, it’s weird that The California Kid’s sidekick is constantly doing a Jack Benny impression. But nothing that happens here is really a betrayal of the main character, who always did have a tendency to let pride trip him up. Whose idea was it for Fonzie to jump the shark? Amazingly, I can’t remember—which is frustrating, as I can usually watch a “Happy Days” episode from any season, hear a joke, and recall who wrote it. My friend Brian Levant, then a talented new member of the writing staff, believes that Garry Marshall, the show’s co-creator and executive producer, and Bob Brunner, the show-runner at the time, made the suggestion. But what I definitely remember is that no one protested vehemently; not one of us said, “Fonzie, jump a shark? Are you out of your mind?”… There were no objections from the cast, the studio or the network. He went on to add that the show ran for 164 more episodes after “Hollywood: Part 3” (which was Happy Days’ 91st), and that it remained in the Top 25 for five of its six remaining seasons. In two of those, seasons five and six, it finished the year in Nielsen’s Top 5. I’d also note that after the shark jump, there are 12 more minutes left in “Hollywood: Part 3,” wrapping up all the rest of the story that fills up this three-parter. Really, the jump is just a cliffhanger introduced at the end of part two and then fairly quickly resolved in part three. It’s not really the main driving action of “Hollywood,” and to focus on it exclusively is to misremember what these episodes were actually about. Hein leaves contemporary relevance and critical acuity aside in the name of snarky nitpicking, even writing, “We all grew up with these shows and feel betrayed when they jump,” as though the addition of Cousin Oliver to the Brady Bunch cast somehow constituted an act of criminal deceit. The “Jump The Shark” worldview ultimately strains to transform every misstep into an outrage, which is a habit that becomes easier and easier, if that’s all a person wants to do. It’s a sour legacy. I stand by that. As Fox noted in his Los Angeles Times piece, the singling out of Fonzie’s shark jump ignores everything else that was good about the “Hollywood” episodes and Happy Days in general. It disregards the tastes of TV audiences in 1977 and the history of the show to that point. 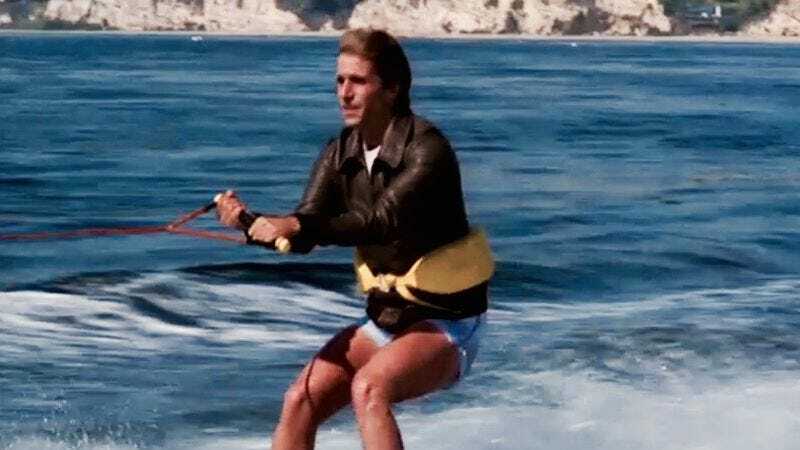 It also fails to take into account that the whole idea of Arthur Fonzarelli waterskiing up a ramp and over a shark is, even today, pretty cool. Do we want a television medium that doesn’t have dudes jumping sharks sometimes? It’s hard to imagine much of an alternative for Happy Days, given the time it was on the air and the way the TV business still works. From the dawn of broadcasting, producers have found something that audiences like in their programs, and they’ve added more of it. Meanwhile contracts expire, trends shift, fade come and go, and before long a beloved sitcom can start to look tired and lost. It’s a process—and an inevitable one in most cases. Rarely can that transition be chalked up to one bad decision. Dozens and dozens of new obstacles pop up each season, and it’s in the process of navigating around them that shows evolve. In a way that’s what makes this artform so fascinating, to see how writers and producers solve problems that are often beyond their control. I root for them to make it, in the same way I root for video-gamers to survive one impossible level so that they can get killed on another. I can’t pretend that I don’t laugh watching “Hollywood: Part 3” when The California Kid shouts, “Fire up the boat! I’m jumping the shark,” because that phrase is so loaded now. But I also can’t pretend it’s not absurdly satisfying to see that pompous idiot chicken out before he reaches the shark-ramp. Fonzie, meanwhile, stays the course, giving Richie a thumbs-up as the moment of truth comes closer. Then the image freezes and the episode goes to commercial, and for just a moment, we can entertain the possibility that maybe Fonzie doesn’t go through with it. Turn “Hollywood: Part 3” off right there, and The Fonz will be forever frozen, neither jumping nor not-jumping. Instead the episode continues, and the show continues. Fonzie jumps the shark. What else was he gonna do?